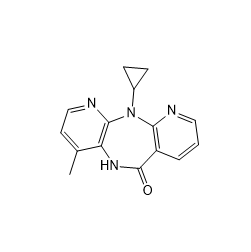 Ro-0335 is a novel diphenylether nonnucleoside reverse transcriptase inhibitor. Zidovudine (Retrovir) is a reverse transcriptase inhibitor. Fangchinoline is an isolate from Stephania Tetrandra that shows anti-cancer activity. It inhibits breast adenocarcinoma proliferation through apoptosis induction. In addition, it has been shown to inhibit HIV-Type 1 replication. Entecavir is a deoxyguanosine nucleoside analogue with antiviral activity against the hepatitis B virus (HBV). Entecavir is a nucleoside analog that inhibits reverse transcription. Pyridoxal is one of the three natural forms of vitamin B6, along with pyridoxamine and pyridoxine. Pyridoxal phosphate is the active form of vitamin B6, acts as an inhibitor of reverse transcriptases, and is used for the treatment of tardive dyskinesia.